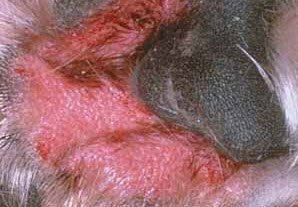 Canine skin rash may be due to a parasitic infestation, especially those parasites which prefer the superficial epidermis (outer layer) of the skin. Parasites include lice, fleas and mites, which are all identified as specific causes of canine skin rashes. The life cycle of parasites initially involves mild bruising and reddened skin and thereafter crusts. Secondary complications develop after scratching and as the infestation becomes more generalized (spread over the body). Allergies and especially those due to pollen, food and potentially those that cause alopecia (hair loss) can lead to canine skin rash. Foods with a high percentages of protein can potentially cause skin rash in some breeds of dogs. Similarly an allergy to pollen can cause skin rashes, especially in exposed skin, like that of the inguinal region (groin), abdomen, feet and head, and around the nose & mouth. Dogs with hair loss, patchy or generalized (found all over the body) can also cause skin rashes. Folliculitis (inflammation in the cells that hold hair) and follicular nervous cell sensitivity can cause a dog to scratch, which obviously can cause bruising of the skin and then setting the stage for rashes to appear. Some dogs on the other hand habitually scratch, which can cause epidermal contusion (injury) & rashes. Sweat glands & hormonal imbalance can cause skin dog rash too, but is less frequent. Skin rashes are only a symptom of a canine skin disorder. 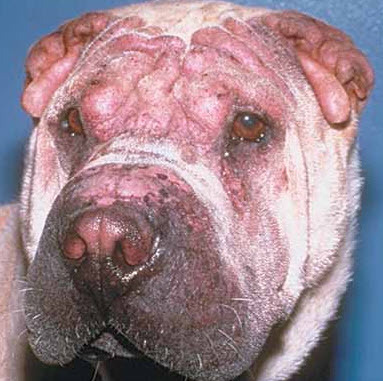 Skin rash in dogs can be termed as an initial sign for any Integumentary (skin) complication. The epidermal skin tissues are sensitive, especially when these are hair less or exposed. Once bruised, scratched or damaged due to a parasite, allergen or any other reason, it may cause a skin rash to originate. 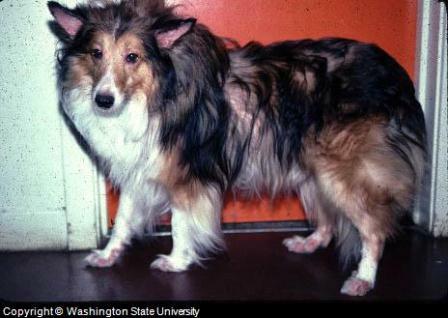 Canine skin rash appears as redness, bumped, swollen and a bruised skin surface. Pain is usually not a sign for a dog skin rash, but the creation of inflammatory cells will cause irritation and thus a dog scratches itself causing other complications. Hair loss or alopecia is surely associated with skin rash in dogs. 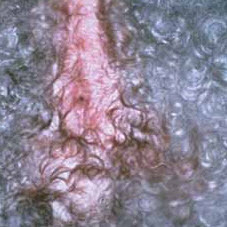 Skin rashes appear at the base of hair follicles more frequently, as once a hair loses its base; the follicle is exposed to pollutants, allergens and parasites. Seborrhea or oily secretions can also influence skin rashes, but is not the primary sign for it. Facial erythema and alopecia. The possible cause is allergy. Canine skin rash on tail- Perianal alopecia, erythema, and salivary staining. Caused by a allergy. Skin Rashes - Pododermatitis (rash on dog paw) caused by dog skin allergy. Rashes (on under-belly) - Malassezia-related dermatitis caused by fungus. Clinical examination, history and seasonal factors are somewhat helpful in identifying the cause of canine skin rash. Usually dogs with initial skin rashes are not clinically available for examination, as canine skin rash is the initial sign for any skin problem. Dogs with frequent scratching, hair loss and itching which result in a skin rash should immediately consult with a veterinarian. 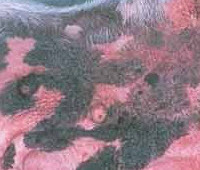 Early identification of a dog skin disorder surely helps in achieving a timely and complete recovery. Skin scrapings and allergen sensitivity tests can help in identifying the cause of a skin problem since skin rashes themselves are only a signal of another problem. Dog skin rashes should be differentiated from skin infections, minor injuries and occasional bruising. Treatment varies based on if the rash is localized to one area or requires a generalized approach which occurs when the rash appears in multiple areas on the body. Local or the topical application of lotions containing anti–inflammatory agents, anti–flea drugs can help in reducing scratching and itching. There is also a herbal remedy available called PetAlive Allergy Itch Ease which could bring some relief. Shampooing with medicated & cleansing agents can help the with rashes and keep them from spreading to other parts of the skin. Anti-lice & Anti–flea shampoos are preferred based upon presence of a causative agent (e.g. Anti-lice shampoo if lice are the underlying cause of the canine skin rash). Natural and Herbal preparations are other options for home treatment plans. Generalized treatment usually is preferred to eradicate the underlying cause of problem. Anti allergy pills or syrups for example are more effective in eradicating skin rashes then a localized administration of skin allergy. Similarly, anti-parasitic drugs along with lime-sulfur dips are preferred for mange caused by mites.